UNESCO World Heritage Centre - World Heritage celebrates World Oceans Day! World Heritage celebrates World Oceans Day! 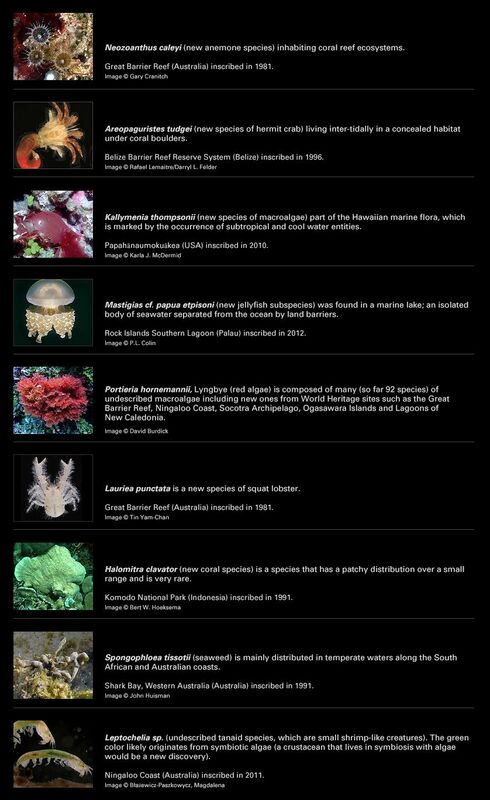 Over 1,000 new species have been discovered at marine sites since their inscription on the World Heritage List. This data has been compiled in UNESCO’s global marine biodiversity data portal Ocean Biogeographic Information System (OBIS). The 1972 World Heritage Convention protects 46 marine sites in recognition of their exceptional natural phenomena, their geological processes, ecological functioning and/or outstanding biodiversity found nowhere else on the planet. Discover few examples of these new species!